My bathroom and kitchen countertops are honed marble. I'm just not sure how to protect them from stains and water spots or what cleaners to use. Do I or don't I seal them? Is it different than polished marble? Do I use an abrasive pad on spots only or over the whole countertop? I do have some spots... how do I get rid of them? Thanks! New marble owners are often confused about how to clean marble and properly protect it from stains and other damage. Certain spots can seem impossible to remove and what caused them anyway? And the difference between polished vs. honed marble maintenance is a common question, but I got you! Marble cleaning & maintenance is essentially the same for all marble countertops or tile, but a few key points about the differences in the surface finish are key to understand. But yes... the type of finish (honed, tumbled, polished) can dictate whether a sealer is needed, if abrasives can be used, and which repair method is required. The finish type (honed marble vs. polished) definitely has a significant impact on the need (or not) for sealing. An interesting factoid is that polished marble is less absorbent than honed. In fact, this is true of any polished stone. The act of polishing marble closes the pores of the stone which reduces the rate at which a particular stone will absorb a substance and potentially stain. Marble is actually pretty dense and not very absorbent. Thus, it does NOT stain easily. And polishing the surface makes it even less so. I know this seems to contradict what you often read about marble, however, there is a massive misunderstanding that exists in the marketplace about marble "stains" which we'll discuss below. Suffice it to say that most polished marble does not require a sealer simply because it has such a low rate of absorption that it is naturally stain-resistant. And just FYI... granite is different in this regard. Polishing still closes the pores but most granite is more absorbent than marble. So, most polished granite countertops will need sealing, although, many granite colors (especially darker colors) are super-dense and will never need sealing. In truth, most polished marble won't even absorb a sealer so it is a futile exercise and potentially problematic. Applying a sealer in such cases can result in a semi-permanent streaky haze. No bueno. One important fact to note about sealing marble and all natural stone... no "one-size-fits-all" rule exists. Basic generalities yes, but each case must be considered on its own. Some marble countertops will take a sealer even when polished, but again, many won't need sealing. How do you know when to apply a sealer or not? Luckily, it is super-simple... just perform the water test for sealing. This test will give you a specific answer for your specific marble. Almost always it is necessary to seal honed marble countertops and tile. You should still test, but in most cases, sealing is best especially in the kitchen where the risk of staining is high. I'd suggest using one of these recommended impregnating sealers, which we've found provide the best performance and durability of any currently on the market. For general cleaning, do NOT use abrasive pads on marble. Marble is dense, but soft and abrasive pads will scratch the surface. It's particularly important on a polished finish where minor scratches are plainly visible, but also on honed finishes. A "tumbled" marble finish can stand up to abrasive scrubbers a little better since the finish is already very rough. It will still scratch, but just not as noticeable. Using non-abrasive pads and cleaners is best. The most important point is to use only products safe for cleaning marble or risk damaging the surface. At least half of all cases of marble damage that we consult with clients about are caused by using the wrong cleaning products or experimenting with homemade concoctions. are too harsh for cleaning marble. 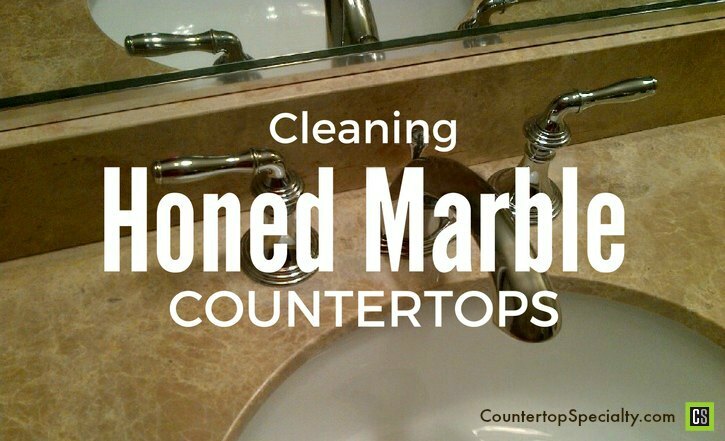 Many customers wonder if specific marble cleaners are required for use on honed marble countertops vs. on polished marble. We get this question mainly regarding cleaners for special issues like soap scum & hard water removal. Or for the mold & mildew cleaner. The finish type does make a difference regarding sealing and for specific repairs (see below). But this is not a factor when it comes to marble cleaners. Any cleaner safe for use on marble can be used on any finish type. Only certain marble repair products affect the finish. Marble-safe cleaners do not. It is a misconception that "marble stains easily". It does not. What is does easily do is "etch" and this is where the confusion starts. Staining and etching both create spots, but in two completely different ways. People label any spot (including etch marks) on marble as a "stain". This is not accurate, but since marble etches easily it leads to the mistaken idea that it "stains" easily. Sealers help prevent stains but will not prevent etching. The common (but mistaken) wisdom is that "marble stains easy" so it must always be sealed and often. But as we learned above, marble is dense, does not stain easy and does not require a sealer in many cases. Certainly, marble can stain and honed marble stains more readily than a polished marble, but the risk is lower than with granite countertops. So... you have spots on your marble. What kind? Stain: a spot darker than the marble color indicating a substance that has absorbed into the stone. Etching: a lighter spot, often white or chalky, and duller than the surrounding finish indicating chemical damage as a result of contact with an acidic substance like juice, coffee, alcohol, fruit, salad dressing, or a harsh cleaner. If you have a stain (dark spot), you'll need to follow the step-by-step instructions in the Removing Marble Stains Manual. Regular cleaning methods won't get a stain out of stone. Or you can use the "pre-made" marble stain remover. Etch marks are a different story. You may need professional refinishing, but light etch marks can be removed on honed marble countertops with a DIY sanding method detailed in the Removing Etch Marks Manual. For a couple etch marks here and there the DIY method is fine, but for the best results, it's best to hire a marble restoration pro to re-finish a honed countertop with many scattered etch marks. Note that the method used for repairing etch marks does depend on the type of finish. 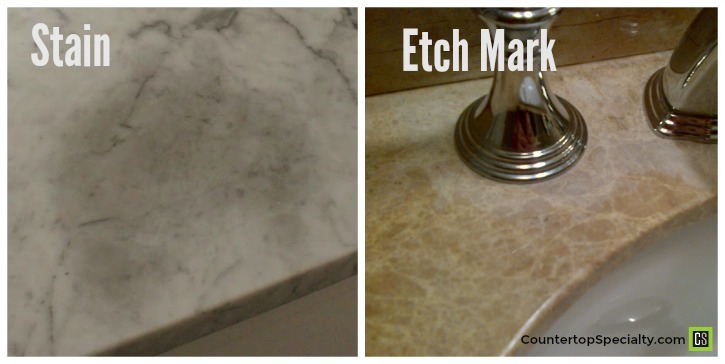 Polished marble etch marks can be repaired using the Marble Etch Remover. But no such product exists for use on honed marble. It's DIY or a professional for honed etch mark removal. It is sometimes recommended to hone a polished marble in order to "solve" the etching problem, but re-finishing marble is expensive and this does nothing to stop etching. Etch marks are less visible on honed marble than on polished marble, but honed marble etches exactly the same as a polished marble surface. Again, sealers will help prevent stains, but not etch marks. Etch marks are physical damage to the marble itself so a sealer cannot prevent that in the same way that car wax cannot prevent scratches to your car paint. Marble kitchen countertops are not recommended due to the problem with etching. You will absolutely get etch marks over and over. The only way to prevent etching is to prevent contact with acids... nearly impossible in a kitchen, but using coasters, trivets and large cutting boards for all food prep will help. Etching is not a big problem on marble bathroom countertops. It can occur, but exposure to damaging substances is so much less than on kitchen countertops. Honed marble countertop cleaning and maintenance does present some mysteries, misconceptions, and frustrations, but all it takes is learning the key details presented above to wipe away the messy confusion and begin protecting and cleaning your marble with ease. I’m about to buy a gorgeous honed piece of marble for my kitchen island. It’s a unique dusty mauve color. It’s honed. I have 4 teens and we just returned from Europe. I’m aware of what will happen to this countertop and I’m in favor of the lived-in look. My question is - the seller is indicating that if they seal the piece it will darken slightly and if they polish it will darken even more. I’ve already ruled out polishing, but am curious re your thoughts on sealing. What are the benefits, does it require different maintenance, will I have to reapply? I really don’t want to be fussing with this countertop but I’d like some impartial advice. Sealing a honed marble may darken it some, but it should not be drastic. Impregnating stone sealers are designed to preserve the natural color of the stone (that is they do not change the color or the finish). But a sealer could change it slightly. Now a "color enhancing" sealer will definitely make the color darker. That is the purpose of this type of sealer. Sealing will help prevent staining and honed marble is more prone to stains than polished marble (polishing closes the pores). You will need to re-seal it periodically unless you apply a "permanent" sealer like Senguard (see link above). But other than that the maintenance is no different that if no sealer is applied. Although, you'll have more stains. Stains can be removed but a bit of a pain. Now, sealing won't prevent the major maintenance issue of marble countertops in the kitchen... that is "etching" from acidic foods and drinks. Etching will occur whether you apply a sealer or not. The only prevention is to eliminate contact with acids and that is not possible in the kitchen. DIY repair of etched marble is fairly easy but you'll have to do it a lot on a marble kitchen countertop. You won't see the etch spots as much on a honed surface but they do still occur just like on polished marble. If you can, get a sample piece of the marble and apply a sealer to see if it changes the color. Or just leave the marble untreated and learn to remove stains and etch marks or let it age as is. I recently bought and had white honed marble tile installed on my master bathroom floor. The installer never sealed it before he grouted it with light grey grout. Needless to say it doesn't look like it did when I purchased it. Is there anything I can do to correct it? Well, that depends on what the actual problem is. It is not imperative to seal marble tiles prior to grouting. Only if the grout color is significantly darker than the stone. If the tile looks darker around the edges (like a picture frame) then the grout did absorb into and stain the marble. If just in a couple places then you may be able to remove these "stains". But if all over on most tiles, then ripping out is the only real cure. However, if the problem is grout haze making the surface look dull and streaky, then use this Hard Water Film Remover. Works well to remove grout haze. I have honed marble countertops in my bathroom. I clean water after every use but there are some spots or marks I can't get rid off. I read you recommended using steel wool 0000 but I am not clear if you mix it with water or you use it on dry surface. I'm concern it may scratch the surface. Can you describe how to use it please? The 0000 grade steel wool is super-fine and won't scratch the surface or rather it won't scratch it in a bad way. It will scratch it on a microscopic level which is what you want. It works like sandpaper on the marble.... smoothing it. The spots you have a probably etch marks (from acidic products, foods, drinks) and not hard water spots. To remove or repair etch marks on honed marble you need to use more abrasive sandpaper. You'll find complete instructions in the Repairing Etch Marks ebook. In over their heads - ah ha. I think that is exactly the issue. Will proceed with that in mind. Thank you for your time. I did order the cleaner you suggested. One final question - your thoughts on using vinegar, as is suggested old world cooks use in their kitchens? Is it safe for honed marble? Vinegar will etch marble, so not it is not "safe" if you want to maintain the finish on your marble countertop. So, in general, vinegar should never be used as a cleaner in order to avoid etching the finish. However, it can depend on what you want to achieve. It may be that you do want to change the finish and purposely etching it is one way to do that. Using vinegar over the entire surface is a rudimentary DIY method to remove the polished layer and create the honed-type finish. Sometimes people have shiny polished marble and want to have a more rustic look. Washing with vinegar will do it. You may not get an even or super-smooth finish like you would with professional honing, but it will work to do this. Or if you have etch marks scattered over the surface, washing with vinegar make those spots disappear by etching the entire surface to blend in the spots. And that was the habit of the "old-world" cooks to wash with vinegar to both clean and maintain their marble countertops. Note, though, that traditionally marble countertops were not fussed over. Marble will last a long time, so it was a good utilitarian choice for countertops. But no one worried over stains or etching. They just used the countertop and let it age and naturally whatever patina developed. Today, people want marble as a showpiece and desire to keep their marble countertoptops in near perfect condition. Nothting wrong with that, but this perspective presents a problem when you want to install marble for a kitchen countertop. You will constantly wrestle with maintaining the finish. It is impossible to prevent etching in the kitchen. In bathrooms, marble countertops are usually not a problem. So, it depends on what you want to achieve, but washing with vinegar will even out the look of your honed marble by blending in the etch spots. It may also make the surface a bit more rough and rustic-looking. I just read the reply to my post about the water marks (not stains or etching) on my honed marble. We have a whole house water filtration system and I can certainly check for pH, but the same thing happens when my ionized, hi pH water gets on the counter (Our drinking water). The reason I put down the paper towel is to use it as a 'base' to prevent stains, if working with food, or other items. The paper towels have a webbed pattern to them, so, if they used acid to bleach them white, I could see it, but this happens even when the towel stays dry. It's as if the second coat of sealer is the problem. In our bathroom the counters are the same honed marble. They were NOT sealed twice and I do not have the problem there - I am able to rub them dry enough there are not spots. I've read about the vinegar - and since the fabricator suggested using acetone after, I'm wondering if perhaps their last sanding just didn't remove enough of the sealer and I just need to get back to the original stone and start over. I have soapstone in other parts of the kitchen and use mineral oil on them, so took to using mineral oil to smooth out the marble. It looks really good, but of course that doesn't last long. I have no idea if it's bad to use it or not. I would be delighted to have an old world look, but the rings and spots make this counter impossible! I've had marble before and it didn't act like this - I really do think it's the sealer. Thoughts? Yes, it is possible that sealer residue on the surface could be the problem. Not a very common issue with a honed surface (vs. a polished surface that is much less absorbent and sealer residue can occur easily) but possible. However, if the surface was re-honed (sanded) after it was sealed twice, then there should not be any sealer residue on the surface. Likewise, if you cleaned the surface with acetone. You state these drops are not "etching" but they are dull spots. Typically, dull spots on marble are etching. However, since this is water the other possibility is hard water. When the water dries the minerals in the water are left behind and this can create a dull chalky spot that can look very similar to an etch mark.... like spots on drinking glasses after washing. Really, these are the only two possibilities... etching or hard water deposit spots. The fact that you have the exact same marble in another location without any issues certainly adds to the mystery. If the same water is contacting that other marble countertop and you don't have any issues, then it would support the theory that the sealer or some other film is creating the problem. Still, I would investigate your water filtration system, just to know for sure it is or isn't involved. Note that marble etching can occur at both ends of the pH spectrum (high pH like bleach can etch as well as low pH acidic substances). So your ionized water creating spots doesn't necessarily rule out filtration as a cause. I doubt the ionized water has sufficiently high pH, but worth checking. Honestly, when you've heard a million and one different scenarios of marble spots like I have it usually isn't too hard to diagnose the cause. This one has me scratching my head a bit. I'd consider a complete refinishing of the surface. But, I'd contact an experienced and reputable marble restoration professional to inspect it first and get an "in person" opinion. Your current fabricators seem to be in over their heads. I have honed carrera marble and have water spots all over the place! Simple drops of water leave a dullness as does using a dry paper towel (you can see the webbed imprint of the paper when you lift it up). I did what the marble place told me to do and sealed it but later found out the fabricator sealed it before I did but no one told me. They tried sanding the entire slab and told me to use an acetone on it but it's still the same and every subsequent drop of water leaves an imprint. Help! I'll assume you know for certain it is water that is causing the spots. Most often in such cases, people think that water is causing these dull spots (called "etching") when, in fact, it is some other substance. So, if it truly is water, then the most likely reason is because your water is acidic. Acidic foods, drinks, personal products, and harsh cleaners can cause etching on marble. Pure water will never cause etching. However, some city water supplies can be acidic or if you have a water filtering or purification system it may not be set properly making your water too "soft" by stripping out all the minerals that balance the pH of the water. The result can be a lower pH and acidic water. The paper towel issue, I cannot explain, I'm not sure of the reason for placing a dry paper towel on the surface. If using it to wipe up liquids and it gets wet, then leaves an impression... it is probably just the way the paper towel pattern affects how the liquid contacts the surface. And if it is the water you are wiping up and it is acidic, then you could get etching in the shape of the paper towel pattern. That's my best guess on that one. Note that stone sealers prevent staining (liquids absorbing into the surface). Sealers do not prevent etching, which is physical corrosive damage to the marble surface. So, I'd have your water supply tested or check you purification system if you have one. On honed marble, you can try sanding the etch drops with 0000-grade steel wool. If that is not sufficient, then go with a more coarse 400 or even 200 grit metal sandpaper and finish with the steel wool. I have thassos tile. There are rust and coffee stains. I am thinking about using lemon and or rubbing alcohol to remove the stains. Any input? Yes, neither alcohol or lemon juice will do a thing to remove coffee or rust stains, but the lemon juice will etch the marble entailing a second repair. Stains in marble cannot be removed by standard cleaning methods... like scrubbing with a surface cleaner. A special method is employed to draw out stains. Rust stains are uniquely difficult and require a more specific formula / method than for coffee or oil or other common marble stains. You'll need to use the appropriate natural stone stain removal product on the linked page. I just did my countertops in honed marble as well and although I LOVE the way they look, I have a hard time cleaning them? Everything I use (whether it's just warm water or a marble cleaner) leaves the counter tops very streaky. Any suggestions?? Water will streak simply because it takes a lot of wiping with dry towels to remove all water. Any water left to dry will show a residue. In fact, if any product or liquid is left in sufficient quantity on the surface it will leave streaks after drying. Like any product marble cleaners are not all created equal. Many will leave streaks even after extensive wiping and drying. However, a few marble cleaning products are engineered to dry very quickly when in use, so you have to do minimal wiping to clean and dry the countertop, thus eliminating streaks. The best product we've found for general stone cleaning is this Granite Countertop & Marble Cleaning spray. It dries streak-free, makes the countertop super-shiny, mild pleasant odor and very inexpensive for professional quality product. A honed surface is still smooth and really isn't any different to clean than a polished countertop. I am always surprised at the way the American market views marble floors and counter tops. What is this obsession with wanting things to look always new? BEFORE granite was used on counters or floors, marble was the stone of choice. If you travel to France, Italy, Spain or Portugal--all those counters you admire or those tops on tables in chateaus are all MARBLE. And it is marble that has endured CENTURIES of pastry and wines and beers and often has mellowed from a pristine white to a much coveted cream or yellow and a "saddling' in the middle where the dough was rolled out again and again. The scratches are part of the patina. If people really do not want wear on their countertops or floors and want them to look like new--the best options are never using the room or item with the marble/granite/natural stone OR take a picture and tell everyone this is what you would have had in your kitchen if only it would stay looking brand new. I buy antiques and COVET the mellowed surface of much used marble--cream, please and the scratches are the narrative not something to be edited out. You'll find complete instructions on how to remove etch marks (the spots the windex and goo gone created) in the Removing Etch Marks Manual. The techniques in the manual should do the trick for you, but if the etching is severe, then you may have to hire a pro to re-hone the area so it "blends" with the rest of the surface. The spray splash has left dull spray marks, and then he tried to elminate then with the oily goo gone... it didn't work. Is the spot kind of dull and lighter in color? If so, you have an etch mark from contact with acidic food or drinks. Buy some 0000 grade steel wool pads and lightly sand the area. This should improve and/or remove it. Sealing does not make your marble stain-proof. It just slows down the absorption rate. So, if the liquid sat there overnight say, then you can still get a stain. And sealing has nothing to do with etching. Use coasters, cutting boards, etc. to eliminate contact with acidic substances. The key is that the marble is "honed" and not polished. Vinegar will etch (corrode) marble which is very noticeable with polished marble because it creates a dull spot, but on honed marble you don't notice it as much or at all. And since they are cleaning the entire countertop any etching that occurs will occur evenly and not be noticeable. In Europe marble countertops are common in the kitchen because they hone them and just let them age naturally without obsessing over every little blemish. In the US people like to polish the marble to bring out the depth of color, but they also expect the marble to look pristine, like new for 20 years. That is impossible if you put marble (especially polished marble) in the kitchen. Acidic foods like vinegar will etch the polish and create a bunch of dull spots that look like stains on polished marble. So, if you have a European sensibility regarding this issue then go ahead and install honed marble in the kitchen... it's an excellent surface. A friend recently vacationed in Italy where she attended a cooking class. The cooking school had beautiful honed marble counters and the only thing that they ever cleaned them with was vinegar and water. Apparently they were beautiful. I have always read to avoid vinegar. I soon will be installing white calcatta marble kitchen counters. Could I wipe my counters with a solution of vinegar and water too??? How do I get rid of water stains on my honed marble. They are sealed, but I have water rings? I am having honed marble countertops installed in a couple of days. I have to say that I'm excited and nervous about the whole process, but because marble being a natural stone does it matter that is marks or scratches? Isn't the beauty of the marble that it grows with you and is from the earth? I have been told that rubbing olive oil into the marble (I am talking marble not granite) then the marks or scratches will fade but I am not daunted by that because this is not a man-made stone but all natural. So, I will love my scratches and remember them when I use my kitchen to cook in and use as a kitchen as it should be used. I think the term is "lived in". Cheers to all!